Quick and Easy Carbonara | So Hungary! Now that Pat is in school again and always so busy, I am constantly looking for recipes that can be made quickly for when we don’t have a lot of time, or for those times when I am away and he can whip it up quickly himself. This recipe does just that! From beginning to end this recipe took me less than 30 minutes, and it is also a very cost effective recipe. The creaminess of the cheese and eggs, mixed with the saltiness of the bacon and spice of the red pepper flakes makes this easy recipe super flavorful and sure to please everyone. This recipe is perfect for 2 people, so if you are cooking for more, just adjust the quantities accordingly! Cook your pasta according to package directions in a large pot of boiling salty water. When draining, reserve some of the pasta water and set aside. In a small bowl whisk together the cheddar cheese, egg and 4 tablespoons of the pasta water. In the meantime, put a large pan on medium heat with a splash of olive oil. Once heated, add your sliced bacon and cooked until golden brown. Add the minced garlic and rosemary leaves, give a good stir and remove your pan from the heat. Stir in the cooked pasta. At this time, the pan should have stopped sizzling, and if not wait another minute for the pan to cool slightly, but not too much. Pour in your cheese and egg mixture, and mix well into the pasta until coated. Season your pasta with salt and pepper, and your red pepper flakes. 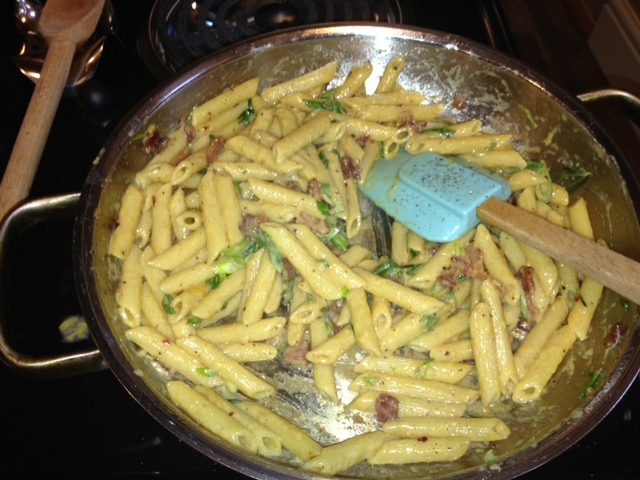 Stir in your the sliced green onions, and serve with a fresh green salad! You will love this recipe and I am sure it will become a staple in your recipe box when you need something fast and easy. This was unbelievably delicious! Thanks for sharing.